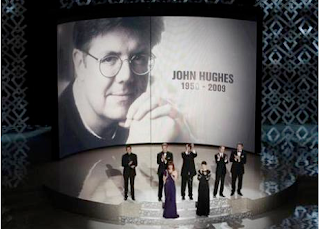 The Oscars paid tribute to the late great John Hughes Sunday night. Introduced by Matthew Broderick and Molly Ringwald, the montage of Hughes moments was following by a touching salute from a handful of his most famous leading actors and actresses. On stage were Anthony Michael Hall, Macaulay Culkin, Jon Cryer, Ally Sheedy and Judd Nelson. Hughes was best known for his coming-of-age films from the '80s and '90s including The Breakfast Club, Ferris Bueller's Day Off, Pretty in Pink and Sixteen Candles. He also wrote and produced the Home Alone franchise. The film maker passed away at age 59 after suffering a heart attack while visiting family in Manhattan.